I was lucky enough to reconnect with several graduates recently – what they tell me is their Paul Smith’s experience helped them more than they ever imagined, not just with what they learned in the classroom but throughout their entire experience. Smitty’s are doers – they know how to get things done! Yet at this point in the semester with tests, papers, and projects due all at once, we can sometimes lose sight of the big picture or feel overwhelmed. Here are five quick tips to help you see your way through these final weeks. 1. Remember to focus on your goals – The days may seem long but your time here will fly by; challenge yourself to step up and make the most of the opportunities available. Be a doer! 2. Stay organized – The time you invest now will pay off as finals approach. 4. Stay healthy – This is one we tend to forget but it is important to keep in mind! You will feel more energized and accomplish more if you take the time eat the right foods, exercise, and get enough sleep! 5. Stay positive – The research is there to show that a positive, growth mindset can have a profound effect on our success! Find balance, stay inspired – take a break and enjoy this beautiful place in the Adirondacks. It will help you feel more positive and able to focus more on your studies. The important thing is to make time for both! Finally, remember at Paul Smith’s College, there is a great support network here to see you through. In the Academic Success Center, we are here to support you at any point in the semester. Take advantage of tutoring, SI, Study Groups and the Writing Center! Create a support network with your friends to study together and stay motivated. It will make the journey that much more fun! Writer BIO: Virginia McAleese, M.S. Ed. is the founding director of the Academic Success Center at Paul Smith’s College and also the coordinator of the first year seminar program. As a professor she has taught numerous developmental and foundational math classes. Her efforts are aimed at increasing the value students receive from their college education and recognizing the power of education to transform lives. She has been a driving force in promoting an academic success culture at the College and was recently recognized as an Outstanding First Year Student Advocate at the 2013 Conference on the First Year Experience. When it comes to cookie-cutter colleges, Paul Smith's is anything but. 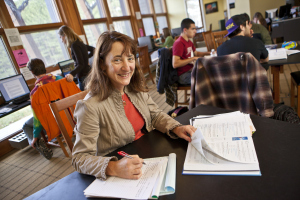 We're the only 4-year college inside the boundaries of the world-famous Adirondack Park. Living and learning here requires a special kind of student - someone who values the abundance of our natural landscape and embraces our spirit of creative self-reliance. If this sounds like you, let's connect!